The official end of the Summer 2010 movie season roars by with Robert Rodriguez’s blood-splattered message movie Machete. Originally showcased as a fake trailer at the beginning of the Rodriguez/Quentin Tarantino Grindhouse double-feature in 2007, the cult following of this idea pushed it into production. Now that the final product is here for everyone to see, they may scratch their heads. For one, Rodriguez has decided to make the full film version of Machete an indictment of U.S. immigration policy. If that doesn’t throw B-movie gore-seekers off, Robert DeNiro cheesing it up as a Texas Senator yelling “Welcome to America!” as he blasts immigrants at the border might. You can’t help but laugh at both of these, the latter pleasantly and the former not so much. It is this battle of the pleasant surprises duking it out with the unpleasant ones that is at the core of Machete. For more of the pleasant, look for the endless ways with which Danny Trejo’s silent-but-deadly protagonist slices up his foes. Weed-whackers, bone scrapers, and a corkscrew are just some of the gory fun he unleashes on the countless, nameless dimwits in his way. Trejo doesn’t really play Machete as much as he picks up the props and lets them do the talking, which suits the movie fine. In Planet Terror, Rodriguez’s contribution to Grindhouse, we were treated to Cherry Darling, a smoldering machine-gun-leg-toting heroine of the old, grimy movie theaters these movies were shown in. Sadly, no such character wraps itself around Machete. Instead, we get Jessica Alba and Michelle Rodriguez, two fully appendaged freedom fighters having a ball being in this mess. This bloody fight on the Texas/Mexico border is what is supposed to be the cheesy plot at the center of the movie. 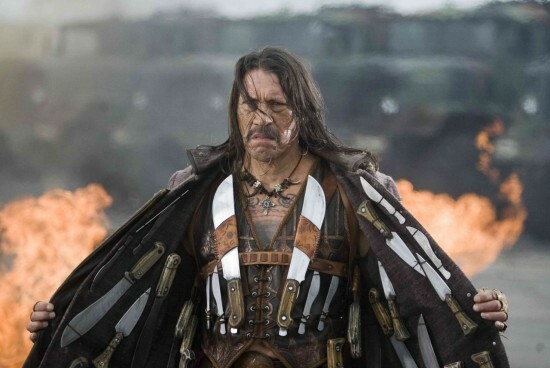 Along with the standard theme of avenging the murdered spouse, Machete is also trying to free his people. This was intended to be corny, and Rodriguez does score some big laughs even if he doesn’t really do anything but Michael Moore the issue in between spouts of blood and one-liners. It is in those times when the heads roll and the laughter ensues that Machete is at home. Trying to transcend the image it is reveling in by overdoing it with the political issue is the biggest drawback. This is partly because both the script and the visual style are too pulpy to be taken seriously, even with Rodriguez’s nifty low-budget camera tricks and clever one-liners. It could’ve been a good 30 minutes shorter and been twice as fun. Rodriguez and Tarantino effectively showed up the glossy Hollywood crowd with Grindhouse, and even though it flopped at the box office, it entertained its crowd more heavily than almost any blockbuster on any given weekend. Sadly, where Planet Terror was happy in its zombie-infested world of sludge, filth, and bad taste, Machete tries unsuccessfully to slice out of it. However, border politics and phones pulled out of vaginas aside, it’s still a pretty wild ride out of a not-so-wild summer. This entry was posted in Reviews and tagged B-Movies, Danny Trejo, Gore, Grindhouse, Jessica Alba, Machete, Michelle Rodriguez, Planet Terror, Popcorn movies, Robert DeNiro, Robert Rodriguez, Summer 2010 movies, Summer movies, Tasteless movies by matterspamer. Bookmark the permalink. After both “The Expendables” and “Piranha 3D,” I think I need a bit of a break from B-movies. But I like most of Rodriguez’s work, so I might give this a chance soon enough. Such a disappointment is seems :/, I really wanted to see this one! I looked so great! I have it on DVD and will be watching it soon. Great review.